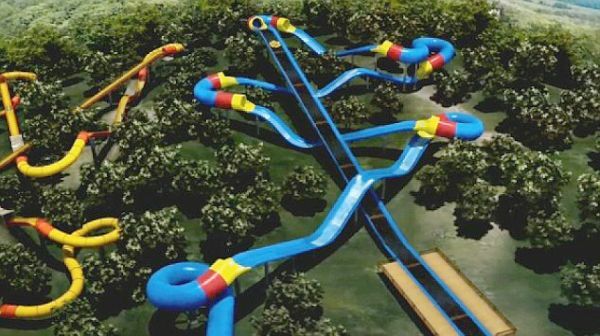 Where is the world's longest water coaster? Do you like thrilling rides like roller coasters? What about wet rides like water slides? Have you ever been on a ride that combines the best of these two worlds? If not, you need to go for a ride on a water coaster! Traditional water slides pump water to the top, so that riders can then ride the water down to the bottom. The water reduces friction, allowing sliders to slip quickly down the slide. Water slides often feature twists and turns that make the ride even more exciting. Riders may travel on a mat, a tube or nothing at all between them and the slide's surface. Water coasters add even more fun, because they combine the wet fun of water slides with the thrills of roller coasters. In addition to descents, they also feature ascents. Rather than sliding directly on a surface, water coaster riders usually travel in large, custom-made rafts that resemble large tubes. Water coasters operate using three different types of technology. Some water coasters are powered by high-speed conveyor belts. Others use water jets that spray water to force the raft along its path. The newest water coasters feature special motors called linear induction motors. These motors create special moving magnetic fields to generate motion. Special magnetic rafts are used with linear induction motors to produce the thrilling ride of a water coaster. The same technology has also been used in Japan to power special magnetic levitation trains. Water coasters can be found in amusement parks and water parks around the world. Splashin' Safari, a water park in Santa Claus, Indiana, features two water coasters. The Wildebeest was the first to be built and it featured linear induction motor technology. In 2012, the park added a second water coaster — called The Mammoth — that also features linear induction motors. The Mammoth is currently the longest water coaster in the world! Tomorrow’s Wonder of the Day takes a look at the wide variety of things people can be really good at! Ready to have some wet and wild fun? If you live near a water park, ask a friend or family member to help you plan a fun outing. If not, there are plenty of ways to have some summertime fun right in your own backyard. 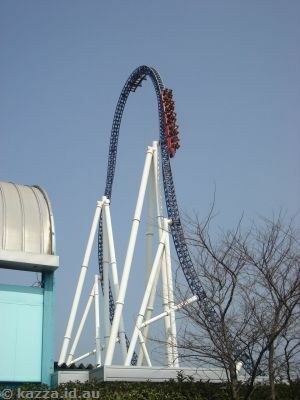 im really scared of roller coasters, but a water coaster seems like the best idea ever!!!! is mayonase a instrument? I saw a water coaster in a mario kart course. It was called sub coaster. The course was so much fun! That sounds like fun!! Thanks for sharing, The train kid! If I wanted to go on a water coaster it would be a small one because I don't want to get really wet because i'm not a big fan of getting wet like really wet. Good clarification, Aiden. If you weren't expecting it, getting soaked wouldn't be that fun. Thanks for sharing your thoughts! A roller coaster without a actual car? Sounds like a blast! It does sound awesome, Austin! Let us know if you ever get the chance to ride on one! I went on splash mountain in Disney My dad did not let us sit in the front or we would got soaked very bad when we would hit the bottom my sister wanted to go on it but it was a 1 hour wait so my sister did not go on but I was lucky enough to get to ride on it it was very fun. Wonderopils have you guys ever went to Disney you guys should it a fun theme park splash mountain and rock and roll was my favorite. Thanks for sharing your experience, Brendan! Splash Mountain sounds awesome. Maybe the Wonder Team can plan a Wonder Trip to the Magic Kingdom? Thanks for the recommendation! I have always wanted to go on a water coaster but sadly I haven't. We hope you get the chance to go on one someday, Aiden! In the meantime, we are so glad that you checked out this Wonder. I love water coasters! I'm really into water parks. Can you make a wonder on that? Love this wonder. I have once been on a water coaster at King's Island. I got soaked from riding that water ride. Have you been on one before? To Carlos: I think you went on the Jurassic Park ride in Universal.